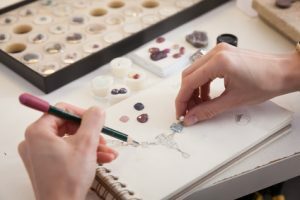 Home › Jeweler's Corner › Have you considered custom designed jewelry? Have you considered custom designed jewelry? You know exactly what you want. But after visiting multiple stores and looking online you still can’t find it. You are looking for something that represents your unique style. Or perhaps you are looking for a gift for that special someone and you can’t find a piece that captures your special relationship. If this sounds familiar, it may be time to consider custom jewelry. With custom designed jewelry the possibilities are endless. Custom designed jewelry offers both flexibility and affordability. We can help you design a piece that will fit into any budget. You may even be able to reuse some of your own stones and metals from pieces that you don’t wear anymore. Or perhaps you can recreate a treasured piece of family jewelry that was lost years ago. Whatever it is you are looking for, the professionals at Amoskeag Jewelers are here to help, stop in today for a free consultation.